I always have an issue with Nutella recipes. What if it isn't as good as just eating it right out of the container with a spoon. You go through all of that trouble and you are down a jar of Nutella. But really, can you go wrong with Nutella fudge? And in addition to the two yummiest words that might exist in holiday baking, Nutella and fudge, you add sea salt. Mmmmm. Nutella. Fudge. Salt. YUM! 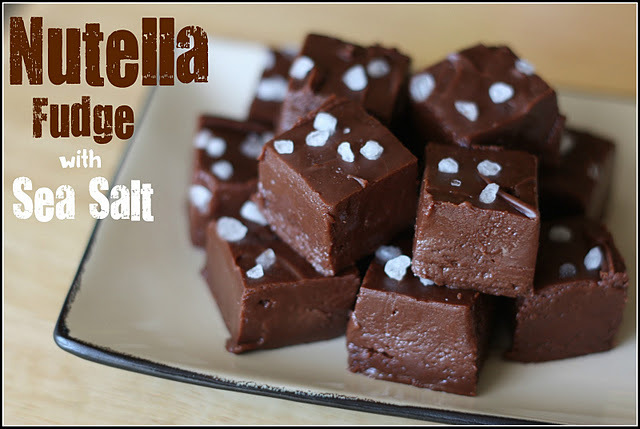 There are a few other ingredients, and you can find the complete Nutella Fudge with Sea Salt recipe over at The Cruchy Mamacita. I promise this really is the most delicious fudge! This looks amazingly good! Making it next week! Oooh, Lorie. This is soooo outrageous! irresistible! Have enjoyed all your holiday decorations as well. Have a happy holiday season!